If you spend time outdoors, you’re going to want a cooler that’s a pro at what does—keeping your drinks and foods cool. Chances are, you’ve considered opting for the best of the best, like a YETI, but then you look at the price tag of the industry-topping YETI and realize that it’s a bit out of budget. We’ve been there—and we’ve heard your concerns. 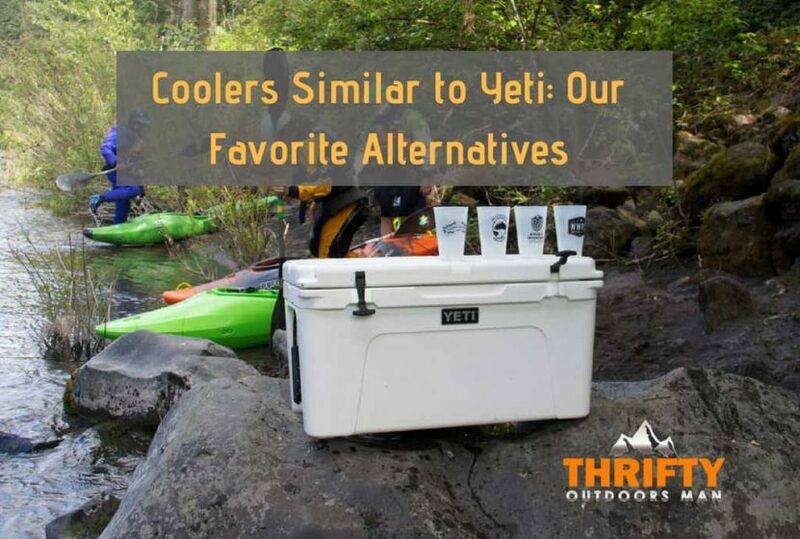 That’s why we have compiled this list of coolers similar to YETI and filled it with our favorite YETI alternatives. When you know you’re the best, you’re not afraid to charge people top-dollar for your services. The same rule applies to YETI. Ever since coming into tremendous success, YETI hasn’t droped the price of any hard cooler beyond $150—and even that’s rare. The popular sellers, such as the Roadie 20 sells for nearly $200, and the larger models, like the YETI Tundra 45 is priced well above $300. Even with gift cards, discounts, and coupons, YETI will eat your money. But when you compare the price of YETI coolers to the following coolers, you’ll see that decent quality doesn’t have to make something unattainable. Many brands have imitated the rotomolded design that make YETis such a prized cooler, but they are doing it while simultaneously upping performance. In the end, if money isn’t an issue, deciding between a YETI and an alternative comes strictly down to the features you want. Though Pelican isn’t really considered “cheaper” by any means, it has gone above being a competitor in design and performance and instead aimed to create a cooler that surpasses YETI. No wonder Pelican ProGear Elite coolers have become a top choice amongst outdoor enthusiasts. If you love having two sets of handles to choose from when carrying a cooler, Pelican offers sturdier options than YETI rope handles. Also, Pelican’s gasket design is superior to competitors, and so Pelican coolers have longer ice retention rates than YETI. Though the price tag is a compromise, if you want the best, forget YETI and try Pelican. If you are looking solely at the price of the coolers, than you will find that the Igloo Yukon Cold Locker is one of the cheapest options available that still compares to YETI quality. For example, if you want a budget-friendly version of the bigger YETI Tundras, you will find that Yukon Cold Locker comes in larger sizes than other challengers, like RTIC. A useful feature would be the UV inhibitors that prevent sun damage. Furthermore, reviewers are ranking this model high in terms of performance. Ice is retained during multiple day trips, and the cooler is remarkably durable. Sure, Igloo might not be a status symbol, but it is reliable. You might know RTIC coolers from their recent spat with YETI over design issues. Though RTIC lost to YETI and has to redesign their coolers, that doesn’t mean they’ve been hindered. It just means they have to change some design features. But the heavy duty latches, 3” insulated walls, non-slip feet, and bear resistance will remain the same. Trust us, RTIC coolers not only hold more ice than YETI models, they are also cost about 50% less than their rival. RTIC coolers come in the most popular sizes: 20, 45, and 60 quarters. Often compared to Pelican ProGear Elite styling, Outdoor Recreational Company of America (ORCA) coolers are one of the top competitors against YETI’s roto-molded construction. This company even has a warranty that outshines other brands. However, when it comes to reviews on Amazon and other outdoor merchandise websites, many buyers claim ORCA coolers perform even better than YETI coolers. Another plus is that ORCAs are made in the USA, unlike YETI. Within the ORCA lineup, there are a plethora of colors and sizes to choose from: 20, 26, 40, 58, 75, and 140 quarts. As the name would imply, Grizzly Coolers are made to be impregnable to grizzlies. The company has made it their objective to have every cooler receive the IGBC Bear Resistance rating, meaning that your cooler will stand up to the wrath of an angry bear and survive. Grizzly coolers have an eye-catching, sleek roto-molded design, heavy duty latches, a metal handle, and a couple of sizing options, such as the Grizzly 20-quart or the 75-quarter to keep you well-stocked on hot days. These coolers also come in a number of stylish colors, like cherry red, lime, teal, and seafoam. The price is a Grizzly Cooler is almost half of what you’d pay for a YETI. Perhaps buying from a well-known brand isn’t your top priority. If that’s the case, consider a nICE cooler. When looking at nICE and YETI models side-by-side, you will find that they have a similar rotomolded construction and sizing. However, nICE coolers come with some features that make other competitors envious, such as the negative pressure seal gasket and pressure-relief button for breaking the seal and making opening the cooler easier. Though nICE coolers only come in 3 sizes (20 quart, 45 quart, and 75 quart) it has all the extras you love, like a built-in bottle opener. On first glance, you’re going to think, “Is this a designer brand?” You wouldn’t necessarily be wrong. Since Orion is a high-end brand, the company doesn’t engage in a lot of advertising. When Orion coolers come from the same manufacturer of Jackson Kayaks, there’s no need for manic ads. Like a YETI cooler, Orion models have rope handles that make the cooler comfortable to carry, even when filled to capacity. Moreover, Orion is a company with extremely appealing designs, lovely colors, superior performance, and bear-proof durability that makes the price well worth it. You won’t find a cooler that holds ice longer than an Orion. The cooler sizes available are 25, 35, 45, and 85 quarts. Though you might not have heard of Palm before now, that doesn’t mean you should underestimate the quality and price of this brand. Since first launching just a few years, Palm has been doing well, and its rotomolded coolers received positive reviews on Amazon almost immediately. In sizing, styling, and philosophy, Palm coolers are nearly identical to RTIC, including the 50% less price tag. However, Palm coolers have a broad variety of sizes, ranging from 30-quarts to a whopping 145-quarts. Another plus? Palm coolers ship for free. 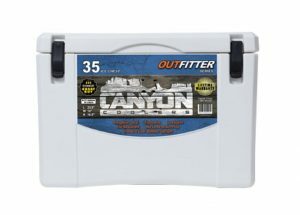 A Canyon Cooler might not be as talked about as RTIC and ORCA or as cheap as Igloo, but it is a definite contender when you consider what these coolers offer. The Canyon coolers has some of the thickest insulation around. The wall thickness is 2.75 inches, and the led thickness is 3 inches. Ice retention for the 35-quart size is 6-8 days, but some users report up to 12 days or longer in the proper conditions. Canyon coolers are also bear-proof, have 100% recessed cam latches, come with a lifetime warranty, and are reasonably priced. You’ll never have to worry about melted ice again. Seeing how Engel has been in business for over 50 years and started out as an AC/DC fridge business, it’s safe to say that these rotomolded coolers are high performance. Engel coolers also have a selection of sizes, ranging from 13-quart and higher. The walls of Engel ice chests are about 2 inches thick with insulation, and ice retention has been rated at 10 days. Additionally, Engel coolers have silicone gaskets, ensuring that there is a limited loss of cool air over time. While some other brands come with lifetime guarantees, Engel comes with 10 year warranty and the IGBC Bear Resistant Certification, which helps it earn a place on this list. Any of the camping coolers on this list are certainly going to get you the bang for your buck that you seek—but some might have the features you need, such as bear-resistance or a specific kind of handle, so do some research before making a purchase. Though they might not be a YETI, alternatives can retain ice for just as long as a YETI and often have similar features and construction. You won’t even think twice about getting a YETI once you have a cooler that works as it should and left you with money in the bank account. Now that you’ve seen our top-rated Yeti alternatives, what do you think? Do you know of a cheaper cooler that deserves to be on this list? Let us know!